Many people have heard of “The Railway King”, George Hudson, but how many have heard of “The European Railway King”, Bethel Henry Strousberg? 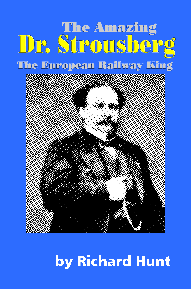 I’d come across the name of Strousberg several times whilst reading about railway development in Europe, but when I looked it up I found that there was not very much specifically about Strousberg available at all and none of of what was available was in English. This, I decided, was a real shame because it’s a story worth telling. Strousberg’s story is pretty amazing. When he left rural East Prussia for London in 1839 he was a poor but ambitious and intelligent 16 year old Jewish economic migrant. When he died in Berlin in 1884 he was virtually penniless. Yet he’d been a successful publisher and insurance specialist in London in the late 1840s and early 1850s. Between 1864 and 1875 he had built up a huge private fortune: he’d constructed railways in Prussia, Russia, Austria, Hungary and Romania; owned iron-ore mines, collieries, steelworks, locomotive and railway wagon and carriage works; lived in a grand mansion in Berlin and a castle in Bohemia; owned over 75,000 hectares of agricultural land and forests. Like Hudson, Strousberg had risen from obscurity to power, wealth and influence. Like Hudson, he crashed spectacularly and died a poor man. This might sound a bit dry, but I think Strousberg’s story has some very obvious parallels and perhaps some lessons for the present day. Important: there have been some problems with the lulu.com ordering system, which should now be resolved.